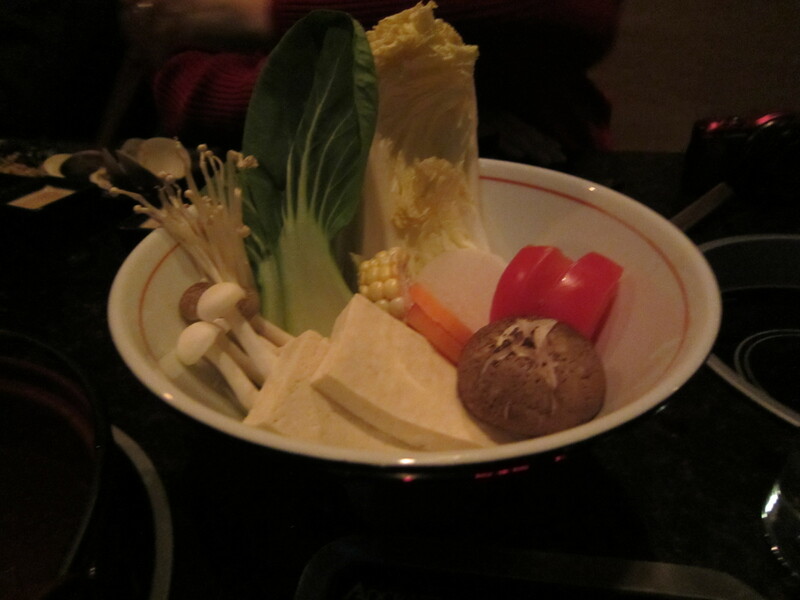 I love any and all forms of Asian cuisine, so I was excited to hear that Cleveland was getting a shabu-shabu restaurant. 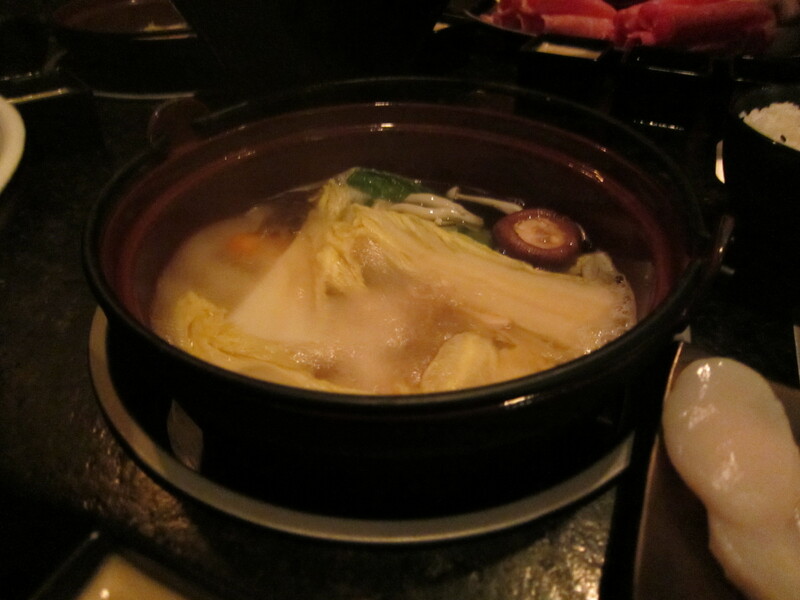 Shabu-shabu is a Japanese hotpot dish of thinly sliced meat and vegetables boiled in water or broth. The meats are cooked piece by piece by the diner at the table, by submerging it in the broth and stirring it. The cooked meat and vegetables are then usually dipped in sauce before eating and served with a bowl of steamed white rice. Once the meat and vegetables have been eaten, leftover broth from the pot is combined with the remaining rice (and in this case the udon noodles, which are at the bottom of the vegetable bowl), and the resulting soup is eaten last. 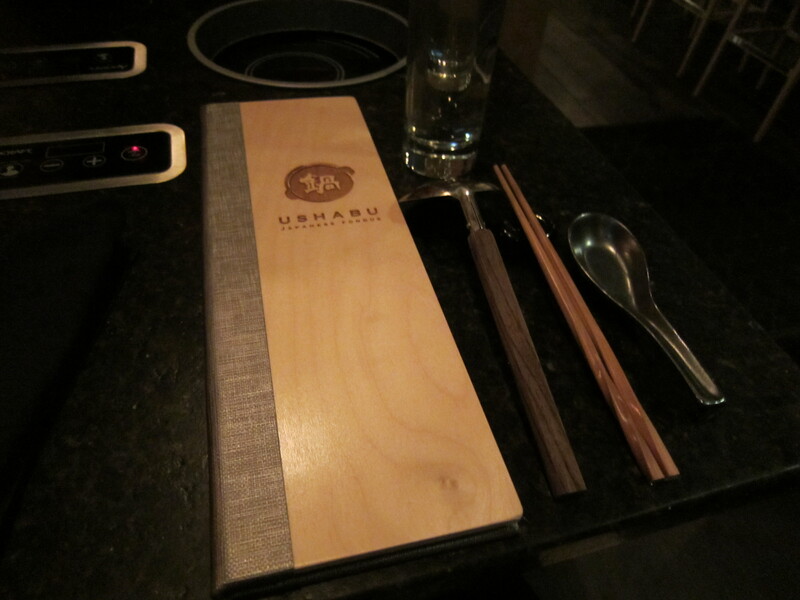 Ushabu opened recently in Tremont, and several of my friends and I went there to check it out. It is located on Professor in a storefront that I could swear used to be an art gallery next to the old Cookie and a Cupcake store. So the place is very small, and reservations are a must. 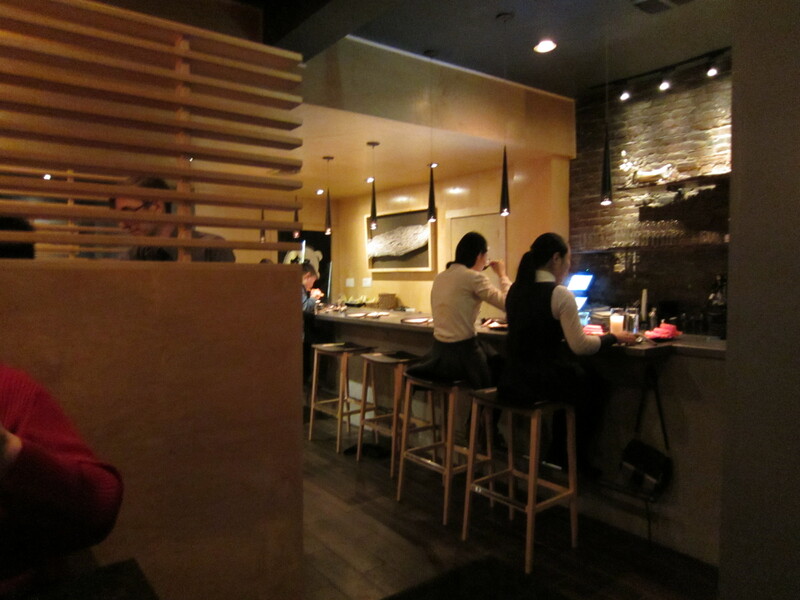 There are about four or five booths and counter seating. The tiny restaurant seats 25 people, and they were turning folks without reservations away on a Sunday night. Edsel made a reservation for 4 at 6 PM, which was perfect because we finished at 8 when they closed. If there are two of you, you might be seated with some strangers in one of the larger booths, which is okay with me since that’s a fun way to meet people. Dante was seated two booths over from us. His restaurant has been serving shabu-shabu to diners for a while now, so if he was here eating on a Sunday I can’t think of higher praise. As it was, we had a cozy little booth up against the window. The windows steamed up from the steaming broth once things started cooking. We started out ordering appetizers. I gave in to the peer pressure and ordered the scallop appetizer. It had a gorgeous presentation, but I honestly wasn’t too jazzed about the taste of the scallop. I normally love scallops, but didn’t love this. 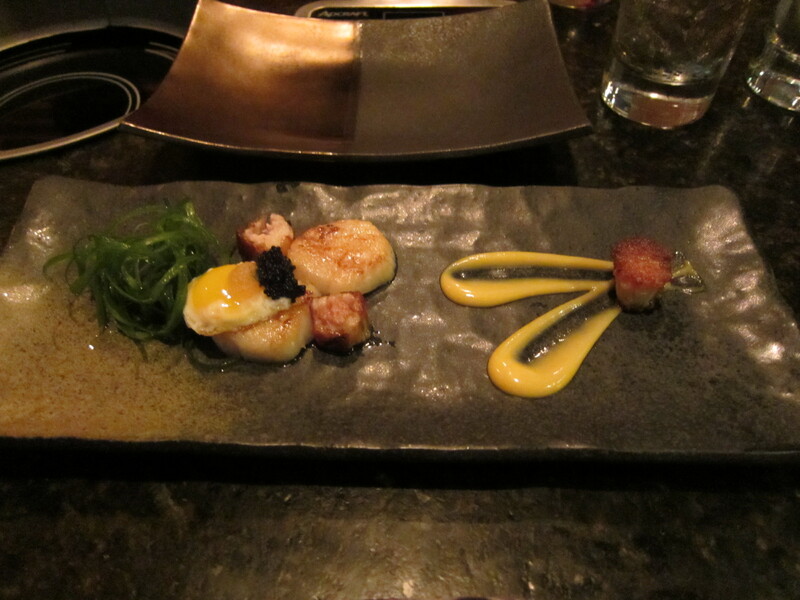 The scallop was cut in half and topped with a quail egg and tobiko and garnished with a couple bites of pork belly. I liked the pork belly part the best. I might try the chawanmushi next time, because it looked delicious. Kind of a savory custard with a shrimp in it. My other dining companions enjoyed their clam appetizer, although the edible sand took a little adjusting to. After poring over the menu and Yelp photos beforehand, I started getting excited about the ginger chicken soup base and tried to figure out what to order first. I ended up going with the seafood combo, since ginger and seafood is just about the perfect combination for this sushi and ginger addict. 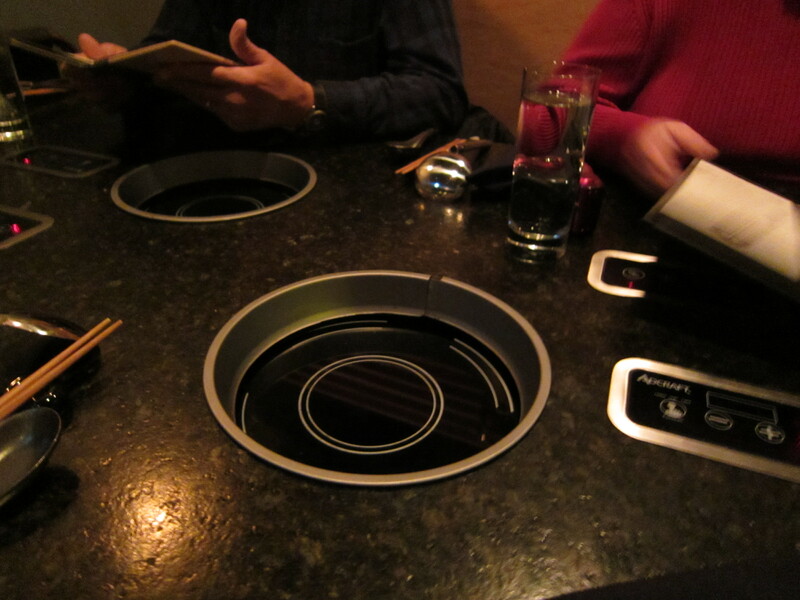 Since I was new to shabu-shabu it took some adjusting to figure out how things work and how long to cook everything. I think my next time will be more successful. In addition to three different dipping sauces (a ponzu, a sesame and a soy), they bring out the soup base, a separate bowl of vegetables to cook in and flavor the broth, and a bowl of white rice sprinkled with black sesame seeds. Each diner gets their own, although our dining companions split one and were given an extra bowl of rice and their own dipping sauces. That was a nice touch. With their appetizer and splitting a beef and pork combo with a fish add-on, they found it was just enough food for them. Onto how things work! Once the soup base gets up to a boil in the induction burner cubbyholes built into the table, it’s time to get cooking. They suggest you put in the more sturdy vegetables like the carrot, corn, cabbage, bok choy, onion and radish first, then move on to the more delicate mushrooms, tomato and tofu. After a few minutes of cooking the meats are then swirled in the broth and dipped in a sauce and eaten with rice. I enjoyed the sesame dip the best, but all three were very good. 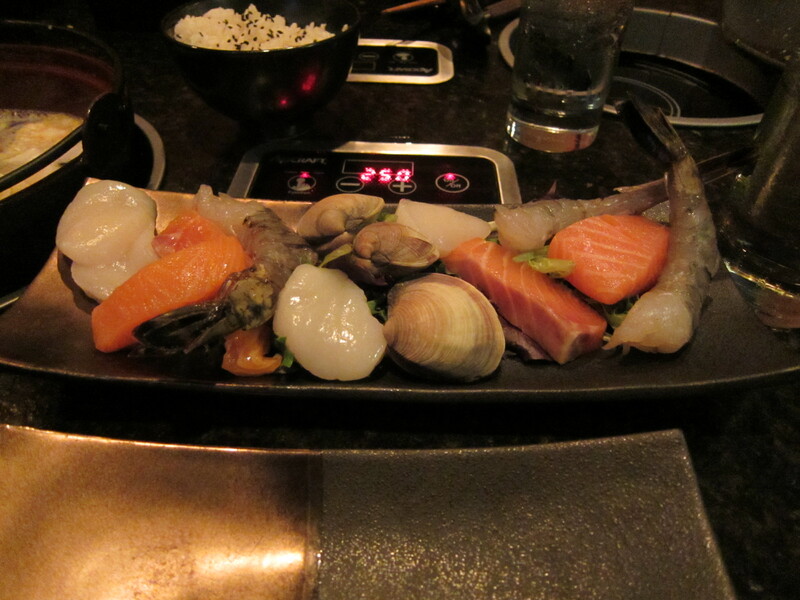 The seafood combo came with 3 clams, 1 scallop (cut into several thin slices), 3 tiger shrimp and what I think was salmon and flounder. I was told to start with the clams first and then branch out to the other seafood on my plate. It took a while to figure out how long to cook my seafood. It took longer than what they said. For instance, it took a little while for the clams to finally open, and my first tiger shrimp was raw and cold in the middle. I put it back in to cook up a little more. It wasn’t a big problem for me since, like I’ve said, I’m a big sushi fan and don’t mind raw seafood or a raw sear. Once I got the hang of it I very much enjoyed it. I will say that I won’t boil my broth as much next time, because the end broth was too salty to eat. I ended up taking it home and cutting it with water the next day. 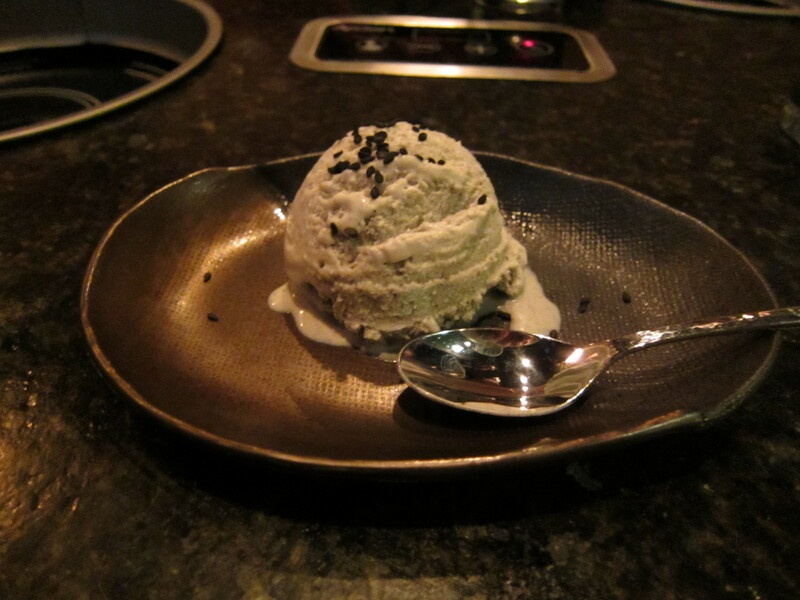 I finished the meal with a nice scoop of Sesame ice cream made by Mason’s Creamery. It was a nice creamy finish to the meal. In short, I enjoyed myself and look forward to going back. I can’t wait to try the wagyu beef. 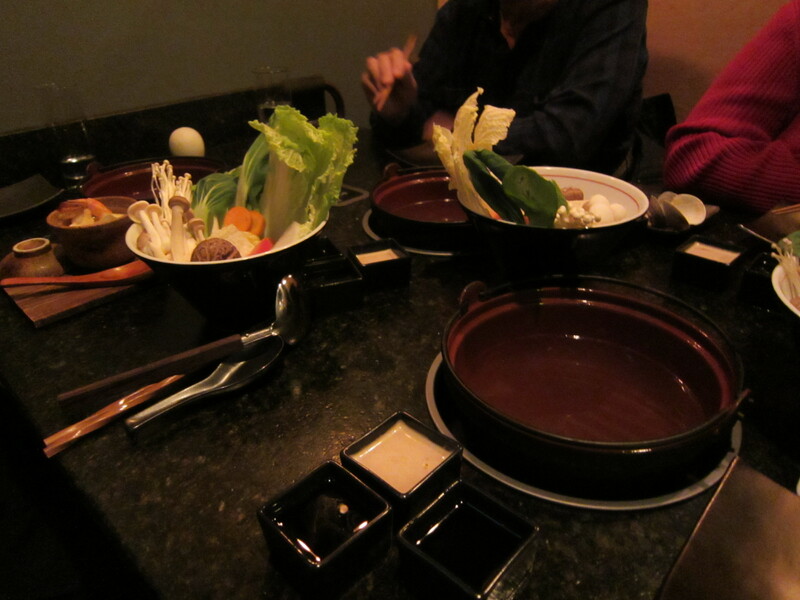 The restaurant is also vegetarian friendly, as they offer a vegetarian option with the veggies and broth. Two of the three soup bases – the spicy miso and kombu dashi – are vegetarian-friendly.